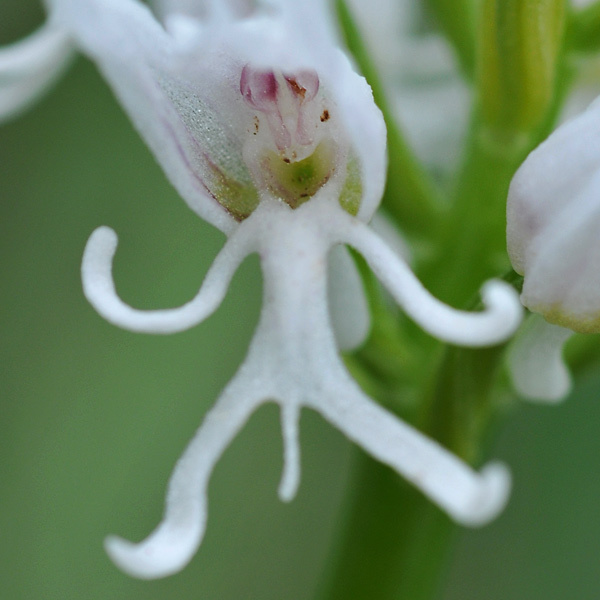 Orchis simia is a near relative of Orchis militaris with two striking differences: It is flowering from top downwards and the ends of the lobes are curled – like the paws of monkeys. Prominent is the strong median tooth, while the hood of the sepals and petals is quite similar to the hood of Orchis militaris. The interior of the hood has lilac veins. The 3 to 6 foliage leaves are rather big and broad, light-green and unspotted. The plant grows to a height of up to 40 cm, the inflorescence has 15 to 55 flowers. 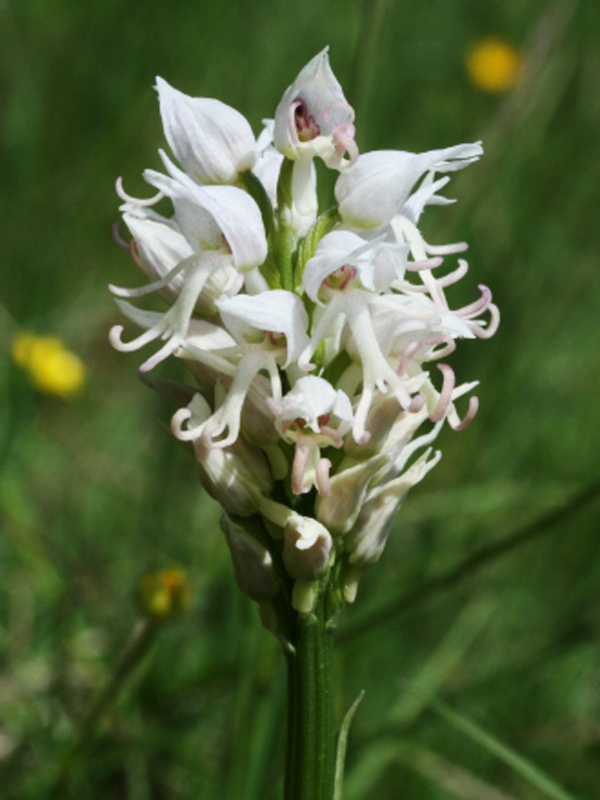 Orchis simia was first described by the French botanist Jean-Baptiste de Lamarck in his “Flore françoise” (1779). The flowers of Orchis simia are mostly purple with a violet-greyish hood. The middle lobe has red papillae. 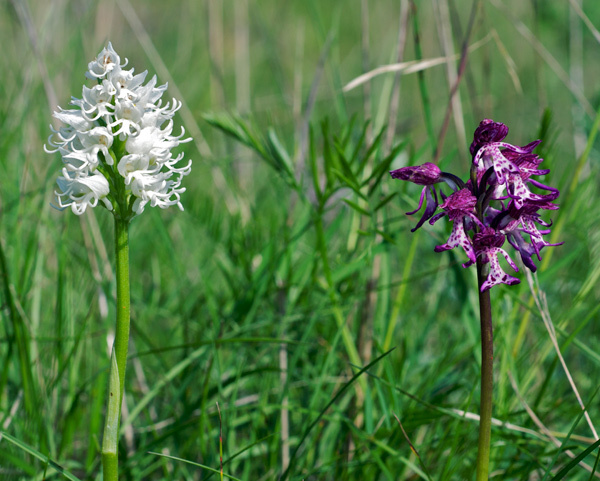 White-flowered plants are quite rare – H.Kretzschmar/W.Eccarius/H.Dietrich (Die Orchideengattungen Anacamptis, Orchis, Neotinea. Bürgel 2007. S.273) mention these variants appear “not too often”. I estimate a likelihood ratio of about 2 per 1,000 plants, more often than with Orchis militaris but much less than with Anacamptis morio. Findings are reported from Switzerland and France. 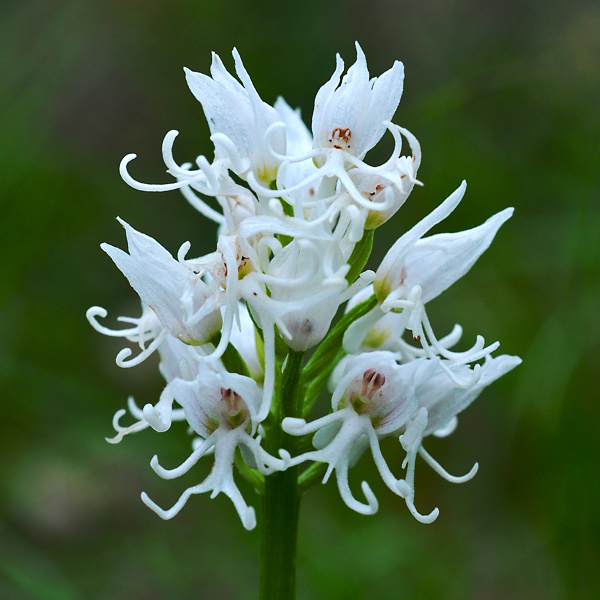 Orchis simia is growing on dry grassland, meadows and pastures on calcareous soils, up to 1500 m. Bloom is from March to June. 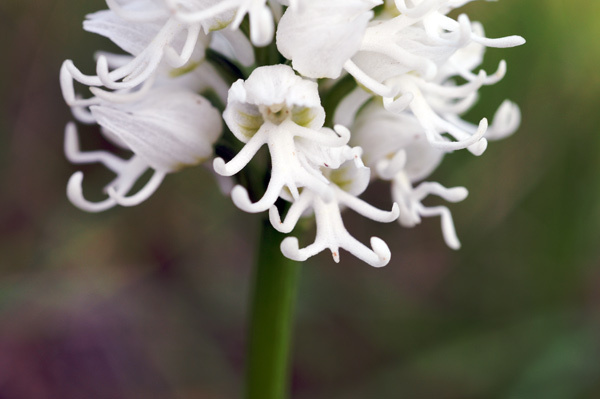 Orchis simia mainly grows in Spain, France, the South Western parts of Germany and Switzerland, on the Balkan and in Turkey.